Nick Knight (born 1958, London) is one of Britain's most innovative and influential photographers and image makers. He has pushed the boundaries of commercial and editorial photography and collaborated with leading names in contemporary art, design, music and fashion. As Director of SHOWstudio he has recently produced on-line collaborations with fashion creatives. This image is part of a fashion story produced for Dazed & Confused magazine in 1998. Art Directed by fashion designer Alexander McQueen, it was hailed as one of the most groundbreaking commercial images of the year. 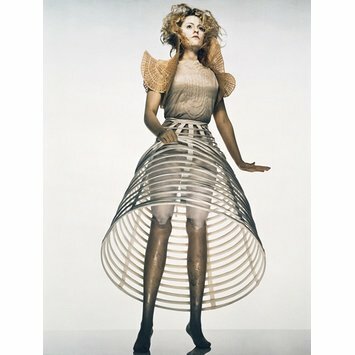 The photograph shows the model Aimee Mullins with prosthetic legs and was used by McQueen and Knight to visualise alternative perceptions of fashion and physical beauty. 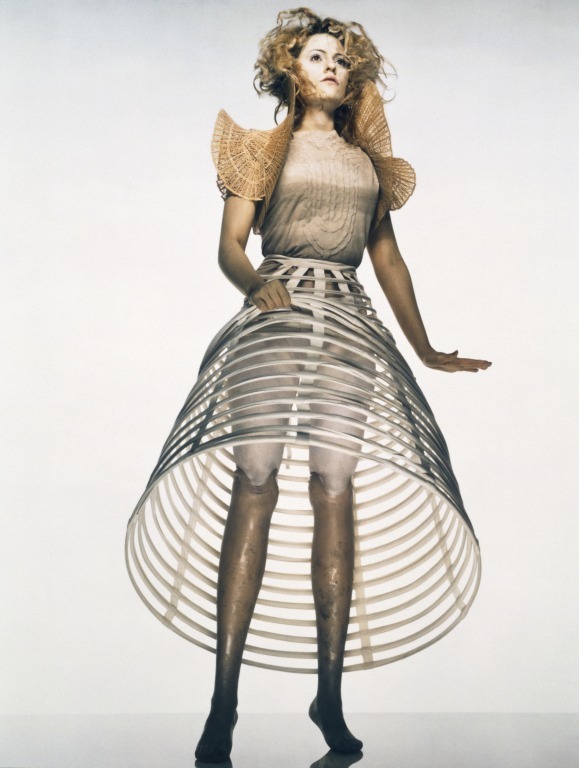 Colour photograph of a female model wearing a skeletal frame of a full length skirt. The model is using her right hand to lift up the front of the skirt, clearly exposing her prosthetic limbs, attached at the knee. The model is looking vacantly out of the photograph, enhancing the mannequin-like qualities of her pose. Clothes designed by Alexander McQueen. This photograph, taken by Nick Knight, is part of a fashion story created for a special edition of Dazed & Confused entitled "Fashion - Able", in 1998. The issue of the magazine was edited by fashion designer, Alexander McQueen. Historical significance: This photograph was published in Dazed & Confused magazine in 1998 and will be remembered as one of the most groundbreaking commercial images of the year. It marks the capacity of Nick Knight and Alexander McQueen's ongoing collaboration to visualise alternatives in perceptions of fashion and physical beauty. Photograph by Nick Knight, 'Aimee Mullins for Dazed & Confused, 1998', C-type print, 1998. Sonia Solicari, ed. Victoriana. A MiscellanyLondon, Guildhall Art Gallery, 2013. ISBN: 9781902795157. Nick Knight, the bold image defies traditional conventions of beauty.